All pictures below were obtained from Defenselink, a massive library of photos and news clips for all things related to U.S. Armed Forces. Information presented on DefenseLINK is considered public information and may be distributed or copied unless otherwise specified. For each thumbnail sketch, I have linked a compact (~200-300K) hi-res jpeg. If you have a fast net connection, you may want to get the original jpeg from DefenseLink using the hyperlink to the right of the thumbnail. AAVs Unload in Stephenville, Newfoundland. Click the picture for a compact hi-res image, or alternately go to the original hi-res shot at defenselink. 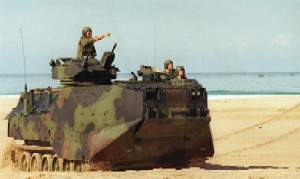 Two AAVs lurk at Onslow Beach. Row of AAVs at Onslow Beach. 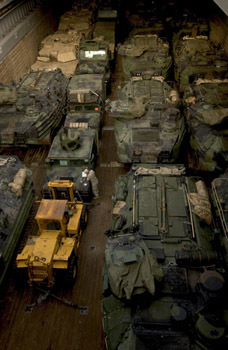 Puny Humvees among Amphibious Assault Vehicles. 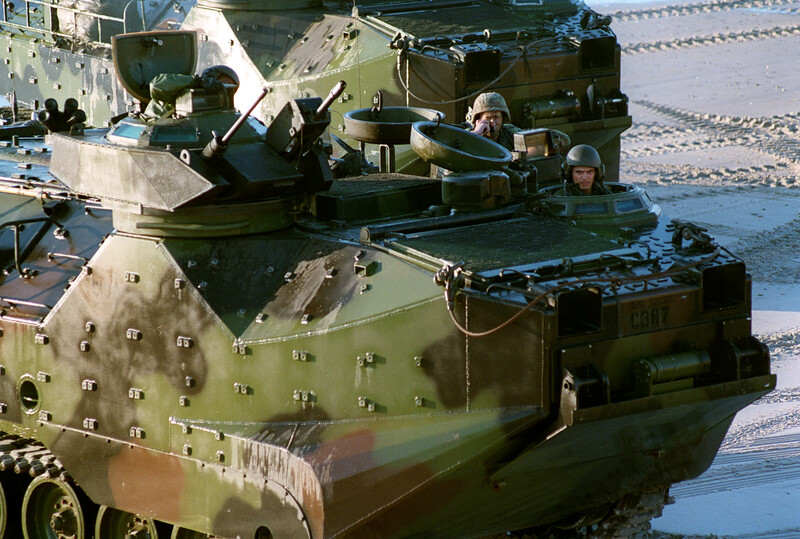 Marines guard their Amphibious Assault Vehicle following a mechanized raid. 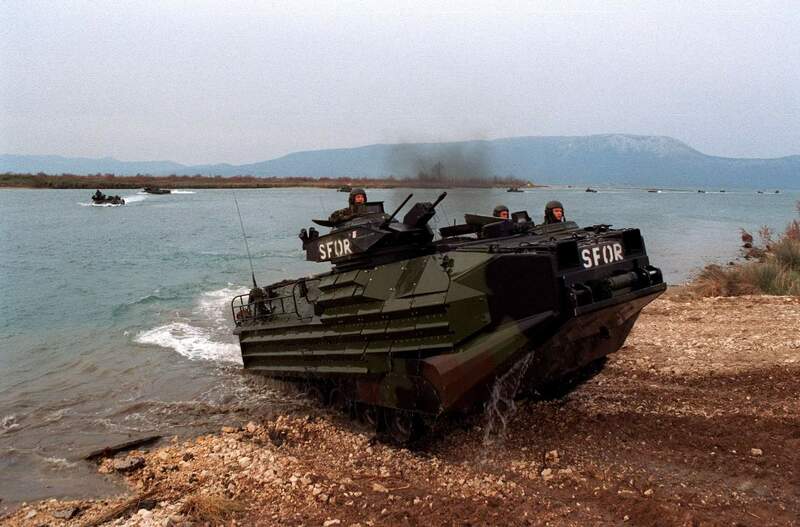 A Marine Assault Amphibious Vehicle comes ashore at Port Ploce, Croatia. 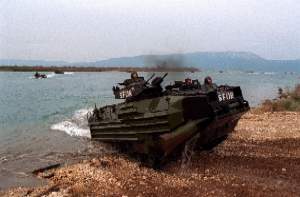 One of a long line of U.S. Marine Assault Amphibious Vehicles from the 26th Marine Expeditionary Unit comes ashore at Port Ploce, Croatia, on March 24, 1998. Assigned to the Strategic Reserve Force of the Stabilization Force, the Marines are taking part in Exercise Dynamic Response 98, a training exercise designed to familiarize the reserve forces with the territory and their operational capabilities within this region. DoD photo by Chief Petty Officer Steve Briggs, U.S. Navy. 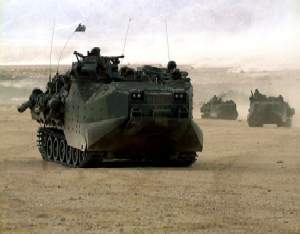 AAV's create waves of dust at the Marine Corps Air Ground Combat Center. Assault Amphibious Vehicles create waves of dust as they return from the field at the Marine Corps Air Ground Combat Center, Twentynine Palms, Calif., during Combined Arms Exercise 5-97, on May 17, 1997. The Marine Air Ground Task Force exercise is allowing these Marines of the 2nd AAV Battalion, 2nd Marine Division, Camp Lejeune, N.C., to practice their desert warfare. DoD photo by Sgt. B.E. VanCise, U.S. Marine Corps. Marine Amphibious Assault Vehicle prepares to enter the USS La Moure County. A U.S. Marine Amphibious Assault Vehicle from Delta Company, 2nd Amphibious Assault Battalion, 2nd Marine Division, prepares to enter the well deck of the USS La Moure County (LST 1194), during Combined Joint Task Force Exercise '96, on May 5, 1996. More than 53,000 military service members from the United States and the United Kingdom are participating in Combined Joint Task Force Exercise 96 on military installations in the Southeastern United States and in waters along the Eastern seaboard. DoD photo by Cpl. A. Olguin, U.S. Marine Corps. 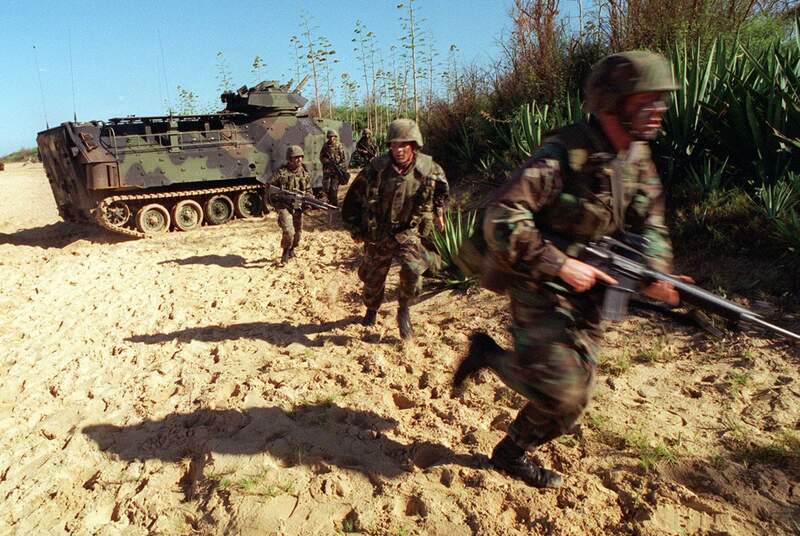 U.S. Marines race through the sand of Kauai, Hawaii, during RIMPAC '96. U.S. Marines race through the sand of Kauai, Hawaii, to establish a strategic position following an amphibious landing in Amphibious Assault Vehicles on June 15, 1996, during RIMPAC '96. 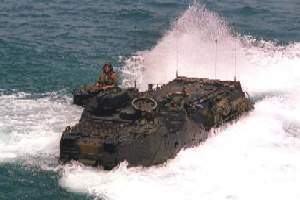 The amphibious assault at Pacific Missile Range Facility, Barking Sands, Hawaii, is being conducted by 11th Marine Expeditionary Unit, Camp Pendleton, Calif., and involves Navy and Marine air, ground and sea forces for training as a combined amphibious assault force. More than 44 ships, 200 aircraft and 30,000 soldiers, sailors, Marines, airmen and Coast Guardsmen are involved in the exercise. The purpose of RIMPAC '96 is to improve coordination and interoperability of combined and joint forces in maritime tactical and theater operations. Australia, Canada, Chile, Japan, the Republic of Korea and the U.S. are participating in the exercise. DoD photo by Petty Officer 2nd Class Jeffrey S. Viano, U.S. Navy. Amphibious Assault Vehicle maneuvers on the beach during RIMPAC '96. 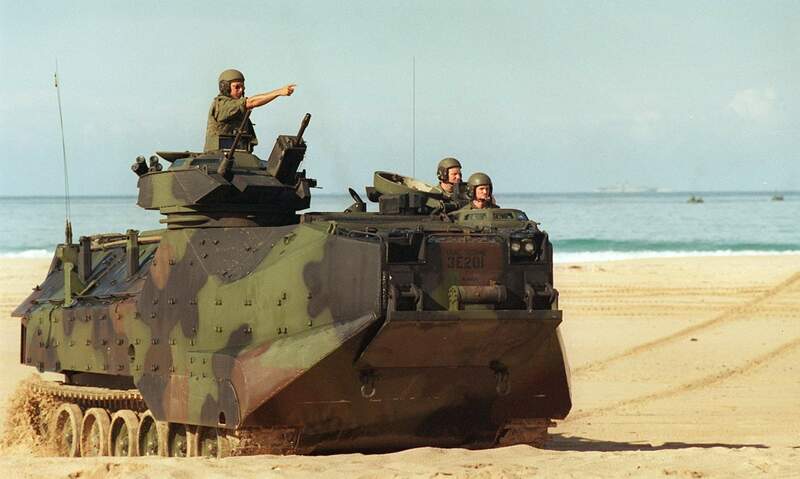 A U.S. Marine Corps Amphibious Assault Vehicle maneuvers on the beach during an amphibious landing on June 15, 1996, as part of RIMPAC '96. 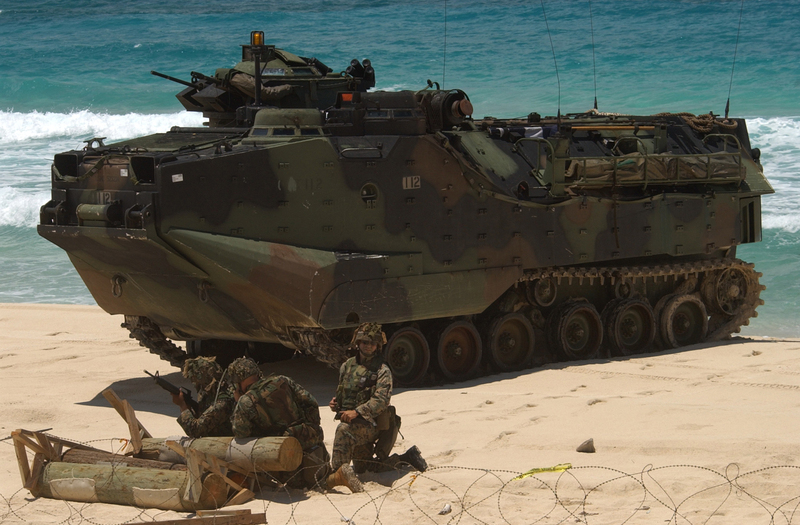 The amphibious assault at Pacific Missile Range Facility, Barking Sands, Hawaii, is being conducted by 11th Marine Expeditionary Unit, Camp Pendleton, Calif., and involves Navy and Marine air, ground and sea forces for training as a combined amphibious assault force. More than 44 ships, 200 aircraft and 30,000 soldiers, sailors, Marines, airmen and Coast Guardsmen are involved in the exercise. The purpose of RIMPAC '96 is to improve coordination and interoperability of combined and joint forces in maritime tactical and theater operations. Australia, Canada, Chile, Japan, the Republic of Korea and the U.S. are participating in the exercise. DoD photo by Petty Officer 2nd Class Jeffrey S. Viano, U.S. Navy. 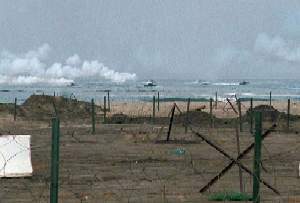 Amphibious assault vehicles approach the heavily obstructed Red Beach. A wave of amphibious assault vehicles approach the heavily obstructed Red Beach at Camp Pendleton, Calif., during Exercise Kernel Blitz 97, on June 28, 1997. 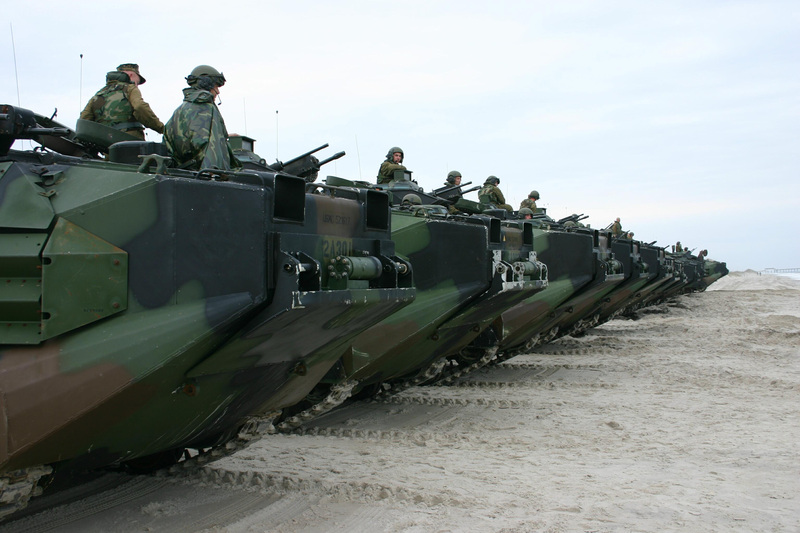 Kernel Blitz 97 is a major amphibious exercise taking place in Southern California and waters offshore. More than 12,000 sailors, Marines, soldiers, guardsmen and airmen are involved in the exercise which is designed to test the Navy-Marine Corps team's ability to project combat power ashore. DoD photo by Lance Cpl. Sylvia Rios, U.S. Marine Corps. 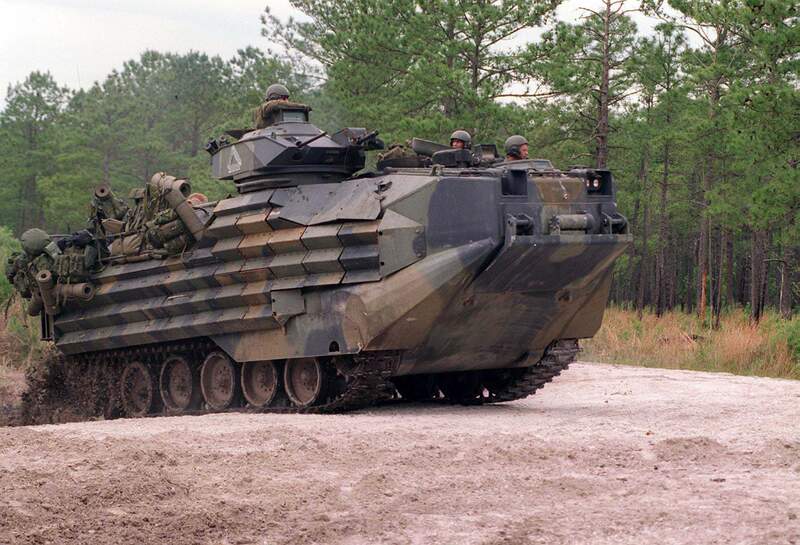 An Amphibious Assault Vehicle speeds towards the enemy at Camp Lejeune, N.C.
An Amphibious Assault Vehicle belonging to Delta Company, 2nd Amphibious Assault Battalion speeds towards the enemy during an assault by Marines of Kilo Company at Camp Lejeune, N.C., on May 13, 1996, as part of Combined Joint Task Force Exercise '96. 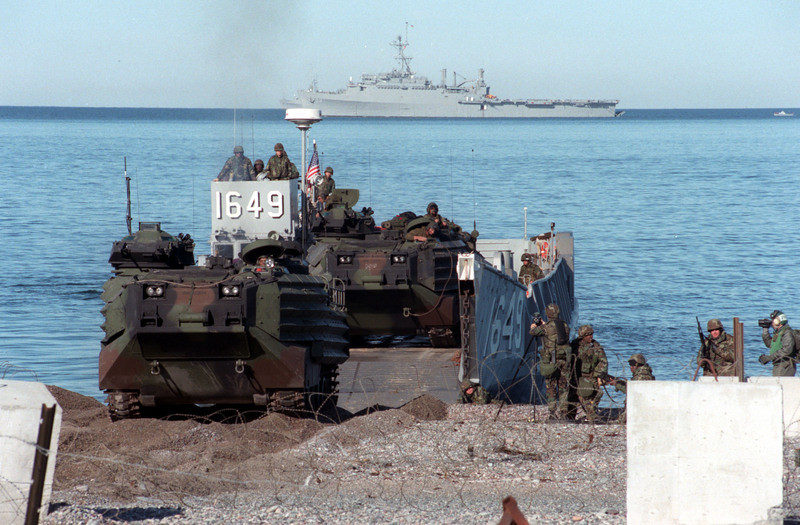 More than 53,000 military service members from the United States and the United Kingdom are participating in Combined Joint Task Force Exercise '96 on military installations in the Southeastern United States and in waters along the Eastern seaboard. DoD photo by Cpl. A. Olguin, U.S. Marine Corps. 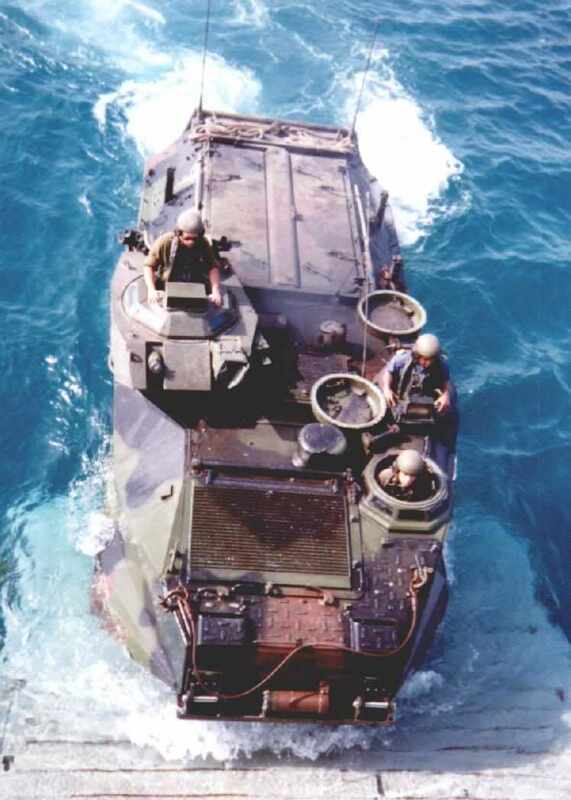 AAVP7A1 preparing to embark LST USS Harlon County, somewhere off coast off West Africa. Note that the AAV's turret has been de-fanged for the exercise. 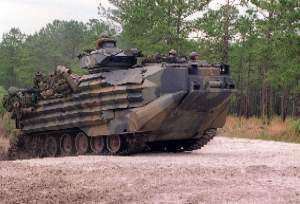 Crewchief Lcpl H.K. Neer. Submitted to Defenselink by Harold Neer.